Yesterday evening FOX aired the second PSA for The Trevor Project with Daniel during an episode of Glee like they announced to danieljradcliffe.tk on Twitter. 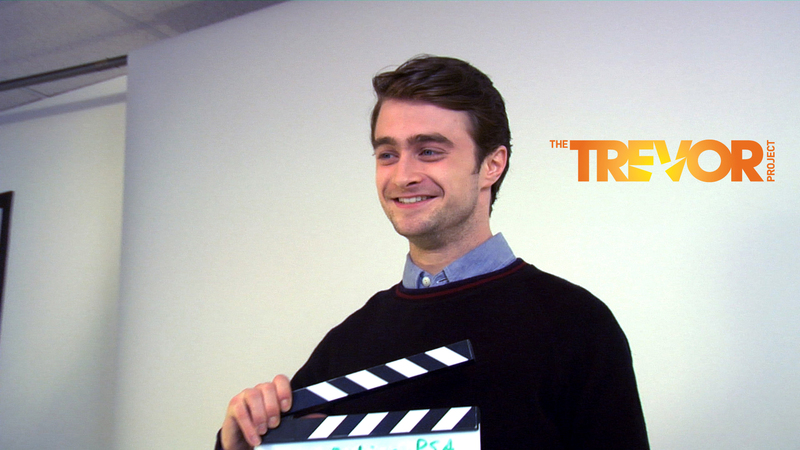 @DanJRadcliffeNL Our new PSA with Daniel Radcliffe airs tonight during @GLEEonFOX at 8/7c. We hope you’ll tune in and spread the word! I'm Daniel Radcliffe and I believe that reaching out for help is the bravest thing a person can do. If you are struggling and need support, call The Trevor Lifeline at 1.866.488.7386. It's free, confidential and trained counselors are there to listen 24/7 without judgment. To learn more about The Trevor Project's lifesaving work for lesbian, gay, bisexual, transgender or questioning young people, go to TheTrevorProject.org. Update: 9th May 2012. A 60 second version of the PSA. This is Radcliffe’s second PSA for The Trevor Project’s cornerstone life-saving program, the Trevor Lifeline. The actor, who currently stars in THE WOMAN IN BLACK, has been involved with The Trevor Project since 2009, dedicating much of his public support to raising awareness for the 24/7 free and confidential Trevor Lifeline for LGBTQ youth in crisis. He was recently honored by the organization as a Trevor Hero at Trevor Live in New York City in June. “My work with The Trevor Project has taught me that the best thing I can do as a straight ally is show my support of lesbian, gay, bisexual and transgender people. When we let someone know that we accept them for who they are and that we are safe to talk to, we can help save lives. It’s as simple as that,” said Daniel Radcliffe, actor and supporter of The Trevor Project. The PSA, which empowers youth in crisis to reach out for help and to call the Trevor Lifeline (1-866-488-7386) was produced by Emmett Loverde, a Los Angeles-based writer-director and cinematographer known for his work on such projects as TRU LOVED (2008), the series FREE ADVICE, and the forthcoming TILL YOU GET TO BARABOO. The PSA is available for broadcast and online use. The Trevor Project is the leading national organization providing crisis intervention and suicide prevention services to lesbian, gay, bisexual, transgender and questioning young people under 24. Every day, The Trevor Project saves young lives through its free and confidential lifeline, in-school workshops, educational materials, online resources and advocacy. Honored by the White House as a “Champion of Change,” The Trevor Project is a leader and innovator in suicide prevention. Learn more at TheTrevorProject.org.